The vast Baghdad slum harbors a key militia but a sweep could backfire. BAGHDAD — U.S. and Iraqi forces have moved aggressively in the last week to combat Sunni Arab insurgents in neighborhoods across the capital and to establish a stronger presence in religiously mixed districts long plagued by sectarian violence. But as the new security crackdown enters a second week, they face their most sensitive challenge: whether, when and how to move into the Shiite-dominated slum of Sadr City, stronghold of the Al Mahdi militia. Political pressure has mounted to crack down on the Baghdad neighborhood that harbors the militia loyal to radical anti-American cleric Muqtada Sadr. Sunni Arabs, who make up the backbone of the insurgency, have long accused Shiite Prime Minister Nouri Maliki of allowing Sadr City to remain a haven for the militia to keep the support of Sadr's followers. "We think that much of the … violence that comes as a result of operations emanating from Sadr City will be remarkably diminished if they crack down," said Ammar Wajuih, a leader of the Iraqi Islamic Party, the country's main Sunni political organization. U.S. and Iraqi military commanders setting out the next steps of the Baghdad security plan are concerned about stirring up a hornet's nest in a neighborhood of more than 2 million Shiites. They worry that by moving too aggressively they could sabotage one of the few success stories in Iraq since the 2003 U.S.-led invasion. 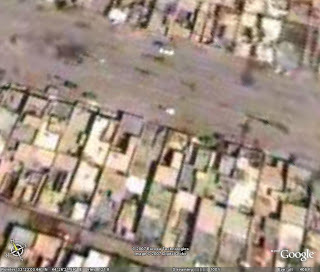 The teeming streets of Sadr City are thriving while the rest of the violence-racked capital wilts. The district pulses with commerce and youth, even as huge stretches of Baghdad fade into ghost towns. They will get a pass. There is nothing there to see or catch.